My Story card: Hattie Farrell remembers going on a tour. 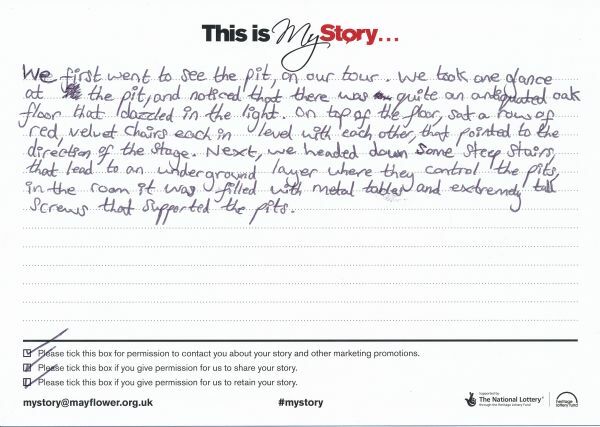 We first went to see the pit, on our tour. We took one glance [at] the pit, and noticed that there was quite an antiquated oak floor that dazzled in the light. On top of the floor, sat a row of red, velvet chairs each in level with each other, that pointed to the direction of the stage. Next, we headed down some steep stairs, that lead to an underground layer where they control the pits, in the room it was filled with metal tables and extremely tall screws that supported the pits.